You've probably seen the battle going on between Elon Musk of Tesla and the New York Times over the strongly negative review the NYT made of a long road trip in a Model S. The reviewer ran out of charge and had a very rough trip with lots of range anxiety. The data logs published by Tesla show he made a number of mistakes, didn't follow some instructions on speed and heat and could have pulled off the road trip if he had done it right. Both sides are right, though. Tesla has made it possible to do the road trip in the Model S, but they haven't made it easy. It's possible to screw it up, and instructions to go slow and keep the heater low are not ones people want to take. 40 minute supercharges are still pretty long, they are not good for the battery and it's hard to believe that they scale since they take so long. While Better Place's battery swap provides a tolerable 5 minute swap, it also presents scaling issues -- you don't want to show up at a station that does 5 minute swaps and be 6th in line. Electric cars have a number of worthwhile advantages, and as battery technologies improve they will come into their own. But let's consider the economics of a long range electric. The Tesla Model S comes in 3 levels, and there is a $20,000 difference between the 40khw 160 mile version and the 85kwh 300 mile version. It's a $35K difference if you want the performance package. The unspoken secret of electric cars is that while you can get the electricity for the model S for just 3 cents/mile at national grid average prices (compared to 12 cents/mile for gasoline in a 30mpg car and 7 cents/mile in a 50mpg hybrid) this is not the full story. You also pay, as you can see, a lot for the battery. There are conflicting reports on how long a battery pack will last you (and that in turn varies on how you use and abuse it.) If we take the battery lifetime at 150,000 miles -- which is more than most give it -- you can see that the extra 45kwh add-on in the Tesla for $20K is costing about 13 cents/mile. The whole battery pack in the 85kwh Telsa, at $42K estimated, is costing a whopping 28 cents/mile for depreciation. In other words, the cost of the battery dwarfs the cost of the electricity, and sadly it also dwarfs the cost of gasoline in most cars. With an electric car, you are effectively paying most of your fuel costs up front. You may also be adding home charging station costs. This helps us learn how much cheaper we must make the battery. It's a bit easier in the Nissan LEAF, whose 24kwh battery pack is estimated to cost about $15,000. Here if it lasts 150K miles we have 10 cents/mile plus the electricity, for a total cost of 13 cents/mile which competes with gasoline cars, though adding interest it's 19 cents/mile -- which does not compete. As a plus, the electric car is simpler and should need less maintenance. (Of course with as much as $10,000 in tax credits, that battery pack can be a reasonable purchase, at taxpayer expense.) A typical gasoline car spends about 5 cents/mile on non-tire maintenance. This math changes a lot with the actual battery life, and many people are estimating that battery lives will be worse than 150K miles and others are estimating more. The larger your battery pack and the less often you fully use it, the longer it lasts. The average car doesn't last a lot more than 150k miles, at least outside of California. The problem with range anxiety becomes more clear. The 85kwh Tesla lets you do your daily driving around your city with no range anxiety. That's great. But to get that you buy a huge battery pack. But you only use that extra range rarely, though you spend a lot to get it. Most trips can actually be handled by the 70 mile range Leaf, though with some anxiety. You only need all that extra battery for those occasional longer trips. You spend a lot of extra money just to use the range from time to time. This is part of the justification of the plug-in hybrid, though the Volt and Prius Plug-in are not selling super well. With a PHEV, you really make full use of that battery. Almost every trip exploits all its range, then the gasoline engine kicks in on those medium and longer trips. The cost however, turns out to be also high -- you have to build a full electric car and include a capable (but smaller) gasoline engine. Most PHEVs have very short electric range -- like just 10 miles -- and they also pay a lot (a whole gasoline engine system) to do those medium and longer trips. To top it all off, when you use batteries, you carry around all their weight if they are empty or full. If you want that extra long range, you pay for it with a lot of weight you carry all the time, not just on those few trips which are longer. We now see some of gasoline's huge advantages. It has a really great energy density, can be refueled quickly, and as you burn it up its weight goes away too -- though of course this is also one of gasoline's big problems; the weight goes into the atmosphere as emissions. This discussion is on the cost of the system to the owner (or taxpayer.) Electric cars can be greener (if the local grid is not coal-based) and particularly good if they are small and light. The Tesla, Leaf and others are not particularly small and light so far. McKinsey forecasts L-Ion batteries will be $200/kwh by 2020, making a 40kwh pack cost just $8,000. Put into a small, light car would produce a cost-effective car with no metro-area range anxiety when the decade ends. Can a trailer be the answer? This makes me more enamoured with the concept of a temporary "range extending trailer." I discussed versions of the trailer concept in an earlier post. There are a few variations of such a plan. Some have the trailer just contain extra batteries and a thick power connection -- here you pay to rent the extra range only when you need it. This is mainly of appeal to those who want to be pure electric. Other options include a modest generator in the trailer. I think the physically simplest plan is a "pusher trailer" that just has a conventional motor that gives you a push from behind. You can even recharge your batteries this way by engaging the car's regeneration mode, with some cost in efficiency over a direct link, but you don't need to do this if you use something like this well. Such pushing is unstable and needs computer assist on the steering. It would only be done on long stretches of flat highway, and be halted in the event of steering or braking. Alternately, the trailer could be attached at two points on the rear, able to bounce up and down but not articulated laterally. It could also not be a trailer but something designed to bolt into a special mount (if it's under a few hundred pounds.) Such designs are more likely to be proprietary -- the advantage of trailers is it's easier to develop a standard that many vehicles can use, and allow innovation in the trailer design. Trailers are not speculation. In addition to the company cited above, EV pioneer Alan Cocconi's firm AC Propulsion actually built some for their small EVs. Unlike Tesla's fancy rapid charge stations or Better Place's even fancier battery swap stations, trailers could be located anywhere there is some spare parking space. Gas stations. Rental depots. They could be self-service. They could be robotized with independent steering, allowing you to steer naturally and back up more easily. They could automate a lot of the docking. Instead of pulling over to one of Tesla's rare rapid-charge stations and waiting 30-40 minutes (if there is not a line) your car could automatically plot a short detour to a rental trailer station and you could get hooked up in a couple of minutes, perhaps faster than a gasoline fill-up. Rather than limping up to a trailer with your battery low, your car's computer would plan the trip for maximum efficiency, planning to use electric power for all urban stop-and-go activity and only use the trailer's engine in its most efficient cycle on the highway, with electric assist where needed. This highly efficient use requires more advance planning than a gasoline trip, but you could also be spontaneous at the cost of burning a bit more fossil fuel or getting a more powerful trailer on those trips. You don't want to be fetching (and returning) such a trailer every day. You would size your electric battery perhaps to need the trailer just a few times a month. However, if there were trailer stations along your route to the highway, or in easy-on/easy-off highway stations, you might find it quite acceptable to use one more often, especially if it can attach itself to your special receiver. The trailer, to be cheap, would be quite simple -- a stock car engine, drivetrain and wheels, with perhaps even no transmission. Its fanciest features would be computer control, fancy steering and perhaps a liftable 3rd wheel for docking operations and assist when reversing. 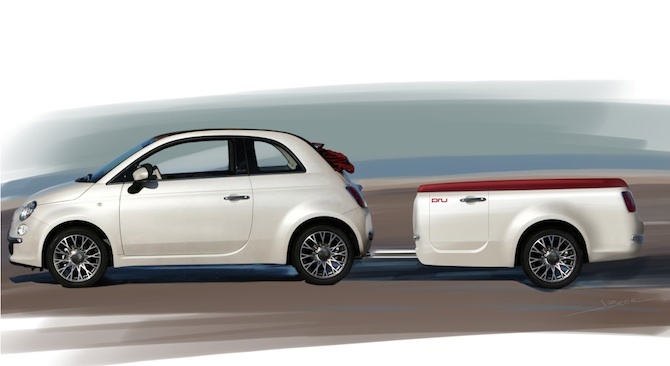 It could be quite compact, and with a smaller car fit into parking spaces by moving up the tow bar -- which is just a metal bar, no electronics. And like the original proposer suggests, some models could come with extra trunk space. You would need a high-power electrical connection between vehicles. But none of the instability of pushing. The only motors needed in the trailer would be steering motors (for easy reverse) and possibly a lower-power motor for docking operations. It's more expensive and possibly worth stealing. There's $15K of batteries in it. You need charging at all the rental locations (though possibly just L1) and each unit has to go out of service for recharge. You still probably only get another 100 miles range out of the unit, but you can stop and swap easily. You could also own a trailer and hook it up at home when you knew you were taking a longer trip. Owning the battery trailer is not that useful an idea, it only saves you some weight: Just get the bigger battery car. The problem here is that you are looking at price only. The true cost to society is different. I don't have the answer here - it is higher for both gasoline powered and electric vehicles - but just using the price as a proxy for the true value is the thinking that is getting us into the mess we are in and it will surely not get us out. For more on value vs price, read Raj Patel's "The Value of Nothing". Ladies and gentlemen, allow me to introduce the latest in transportation systems of the future... The U.S. Space Shuttle orbitor! This is not the (long range) vehicle customers are looking for. I love electric cars. Before I was old enough to drive I wanted my first car to be an electric one. Years later I walked into a GM EV1 dealership and walked out with a phamphlet, sure that I would soon be able to finally "go electric." (I came across that phamphlet in a box a few years ago and still have it, packed back away in that box of memorobilia, to be rediscovered again later.) If GM hadn't crushed that dream for a decade and a half along with the majority of EV-1s in existence we MIGHT now have the infrastructure in place to make electric cars viable as an "only car" solution for people at least in suburban as well as urban areas. The reality though is that getting electric cars to go long distances right now requires a bunch of awkward compromises, much like the development of the space shuttle required. Luckily electric vehicles have the opportunity to get gradually better and better range while still fulfilling real-world purposes, whereas a launch vehicle that can't make it all the way to space is only good for doing experiments. electric car technology just isn't practical for long trips yet. The trouble is that an electrical cars are just toys for rich people with the current technology, just like automobiles themselves at the start of the 20th century. They make more sense as a family second car, which is only used for commuting. When the Lithium-Air battery is developed, then electrical cars will be much more practical. Currently natural gas is a much more practical power source for cars than straight electrical systems. There is just no electric, or hybrid car that can get us to grandma's. Even the 4 seaters have very limited cargo capacity. This is where I feel that the trailer concept begins to show some merit. I might just consider a smaller car, if I know that I can quickly attach a 100 mile rage extender battery and perhaps also some cargo capacity. But I also want to own it. I feel that rental fees, every few weeks, would just bleed me dry. Plus there is the hassle of pick up and return, on their schedule. Tesla offers a battery pack replacement for the 85kWh battery for 12k if purchased up front and installed after 8 years. And one more thing when comparing battery cost to gasoline. One is going to go up in the future, and one is going to go down. If they're even remotely close to break even today, which do you think is the better long term deal/investment? "which do you think is the better long term deal/investment?" Considering the limited residual value of exhausted batteries, buying now could be closer to a sunk cost than an investment. Batteries are indeed likely to drop in price in the future -- which will make electric cars much more cost-effective, and make longer range cost effective. But that proves the opposite of what you're saying. If batteries are going to drop in the future, why would you want to spend a bucketload of cash on them now? It means they will depreciate fast, even if they don't wear out. It's hard to get reliable figures on just how fast they will wear out. After 150,000 miles (a common car lifetime outside of California, here it's about 190K) how much money is that battery pack going to be worth? The fact that there are newer battery technologies will eat into that value of course. But will those old batteries, no longer able to hold as much charge as they used to, be of any value at all other than the metals? How much will the metals be worth? 3) I believe that the batteries will hold some resale value for other uses before recycling, so I'm likely to get some money back there. One thing I've been hoping to see more collected research on is not the usual battery stats like energy density and cost per kwh, but lifetime watt-hours under different duty cycles. Lifetime wh is tricky because some batteries just decline slowly at the end of life, and some have more of a cliff. When a battery has a cliff, it's clearly gone and not for re-use. For slow decline, you see your car's range dropping just a little bit every day -- when is it time to do the expensive pack replacement? It is generally accepted the price of the pack is nowhere close to $12K. This is more a warranty, they clearly don't expect most people to do it. In addition, $12K today is $20K in 10 years time, and Tesla may be making a bet that battery packs will cost half as much in 10 years time. Some risk but not an unreasonable supposition. All other evidence suggests the 85kwh pack costs in the range of $30K to $40K, including warranty and other factors. In fact, that's lower than the commonly cited price of $500 to $600 per kwh today. However, a recent McKinsey study forecast $200/kwh by 2020. If that turns out to be true, Tesla can replace that pack in 8 years for under $17,000, so getting $12K from you today is a money-maker for them even if everybody does it. "As a plus, the electric car is simpler ..."
"...and should need less maintenance." Brad, thanks for a fascinating article, especially the battery economics and trailer discussion. However, as an article that purports to cover the "economics of a long range electric", it seems to gloss over the lower maintenance costs -- no oil changes, no tuneups, no plugs, etc., etc., not to mention far fewer moving parts to break (and personal time devoted to all that). I'd like to see a lifecycle cost for equivalent vehicles -- one electric and the other gas...and, ideally, also a hybrid. I added the figures on that. Gasoline cars average about 5 cents/mile on non-tire maintenance and early-life repairs. So this doesn't move this needle much, even if the electic cars can cut that in half. Perhaps more interesting will be later-life repairs. Will they be better than the gas car and by how much? With many cars, it is the rising cost of repair that ends the life of the car. One day you find that fixing the radiator is going to cost as much as the book value of the car, and you junk it. With electric cars it may be the degredation of battery performance. If keeping an electric car running is an easier proposition that will change the equation. Perhaps you will be able to put in a newer, cheaper battery? On the other hand, will people support a 15 year old car and make parts for it? Will all the other technologies in cars (including robocars) make the car obsolelete even before it wears out? Sadly, car vendors don't really optimize for total lifetime cost of a vehicle, in part because car buyers don't pay as much attention to it as they should -- in fact it should be the main number they pay attention to. What this means is that they don't design vehicles to be easy to maintain -- in fact, making service expensive is something the dealerships like. They also don't always design them to be cheap to insure -- they will put in expensive headlights and sensors in bumpers which make fender benders cost a lot of money. And thus, there is reason to suspect that the electric car makers have not put in as much care as they should to studying how to make the maintenance optimal. In particular, if you are an electric (or hybrid) buyer, you are a little more aware of TCO, because you are paying up front to have lower fuel costs down the road. Many web sites -- kbb, consumer reports, edmunds etc. have 5 year total cost calculators. I would love for them to extend this, letting you input your annual miles, and allow you to go beyond 5 years. With gas cars, a lot of the maintenance/repair cost is not parts, but labour. I would hope that on the electrics, the layouts are simpler and thus labour is lower. Good article Brad, you have given a good picture of the overall costs of all electric vehicles. Sadly it looks like they are still a long way off pushing aside the internal combustion engine. (The company "Better Place" has just pulled out of the Australian market due to the low take up rate". To me the most effective way to reduce the polluting effects of cars is still to keep increasing taxes on the fuels and let the market sort it out. Not a very popular idea but at least it works. Natural Gas is a technology that is more environmentally sound and cheaper than gasoline right now. The biggest problem it that there is limited number of places that you can fill up your tank with natural gas in most parts of the country. If your house in plumbed for gas, then you can buy the equipment to fill up at home. Electricity is the fuel of the future, but we can use Natural Gas right now. CNG is indeed the cheapest fuel available, and it's actually even cheaper than $2.30/gallon. In fact the price at the wellhead, uncompressed is just 43 cents per gallon equivalent, but you must pay to ship it to your car, and for the equipment and energy to compress it. A large fleet pays about 75 cents/gge for the gas, and ends up about $1.20/gge with all the other costs. Retail it's around $2/gge. You can buy it in your house for about $1.20/gge and the compressed cost depends on how much use you get out of the $5,000 home compressor. If you have a 30mpg car you average 400 gge a year so that's a tough slog to compete with the retail (also add electrical cost of compression.) Home compression is also an overnight thing, but retail fill-up is fast. But the other kicker on CNG is the tank. Today's tank is large and eats up a lot of your trunk. The CNG Honda Civic, the only CNG car on the market, costs $5K more than the other civic and has a very small trunk. (One thing the Tesla Model S shines at is trunk space, fore and aft.) And the range is not great -- the tanks only hold about 8 gge -- but the refill is fast unlike electric. However, you need to travel a lot of miles to justify the extra $5K for the car, especially if you want to also justify a compression station. However, for fleet ops (where all vehicles come home each night) it's easy to justify, and the main push now is trucks for long haul. Even if electric recharging is slow, you can generally refill an electric vehicle anywhere there is a 15A 120V outlet, which translates to pretty much everywhere. And even if it takes 57 hours to refill an 85 kwh battery pack in a Tesla with such a pedestrian outlet, there may be times you happen to be visiting someone for at least 57 hours when that wait might not be an inconvenience. CNG filling stations are going to be harder to bootstrap. But for now the charge rate is so slow that I don't know how many people will use it. They have to be going somewhere and not using their car there. The plug in hybrids get away with using the 15a plug since their batteries are so small you can refill them overday or overnight. Annoyingly, the Tesla only takes 12 amps from the regular plug, for safety. As far as I know it does not even have a mode to use 20 amp plugs to get the 16 to 17 amps you would safely get from them. CNG stations are pretty common in some areas, but there are also many places where a CNG roadtrip would be extremely difficult. Though these are areas where electric car roadtrips aren't really practical either -- though almost everywhere has RV parks that can do 50A x 1 phase charging if you are willing to sit for many hours in an RV park. This may change if the plan to use CNG for long haul trucking is realized. Tesla draws only 12 amps from 15 amp outlets because code requires that 80% derating for loads that are continuous for more than three hours. http://shop.teslamotors.com/products/universal-mobile-connector-adapters indicates that they have NEMA 5-20 and 6-20 adaptors for Roadster, but not Model S. Second to last comment of http://www.teslamotors.com/forum/forums/using-dryer-plug claims that one Tesla service center has been selling the dryer adapters. I think I've seen a rumor that RV parks in places like the midwest that experience winter tend to close for the winter, so the RV park charging option isn't quite so universal. And I think that's 10ish hours for a full charge, which might be OK if you find an RV park that makes cabins available for Tesla owners to sleep. I think the real key to making Teslas viable for road trips is a combination of getting hotels to install 30A or better 240V charging infrastructure (which I suspect is pretty cheap in the grand scheme of operating a hotel) and getting the Supercharger network built out. Very little of the stimulus money that went to EV charging seems to have gone to public charging stations at places where people will want to sleep. Oh, I think the charging networks will get built out, and even more superchargers, though Tesla having chosen to use a different supercharger than what was supposed to be the industry standard isn't helping. And while people are finding it's not unreasonable to stop at a supercharger if you plan to stop for a bite to eat, and this works for certain types of trips, I am not sure the supercharge approach really will work for a serious subset. Perhaps I imagine others are like me, but my roadtrips have a highly unscheduled nature to them. I like to just go where I want to go, stop where I want to stop, and having to go through certain places, stay at certain motels, pause at times the car likes rather than times I like -- it's not going to sit well. And the superchargers had better be highly oversupplied, because the first time somebody pulls into a supercharging station to find they have to wait 30 minutes or an hour to get a slot, and then wait for charging, they are going to rethink how well it works. The answer, I believe, is not to try to turn electric cars into long range roadtrip cars, because that's not their nature. Don't try to beat gasoline at its game -- it has a 100 year head start and a supremely good energy density. This is part of why robocars are the answer for electrics. Use your electric around the city, where you drive the most. When you want a roadtrip, get a liquid fuel car. It can even be biofuel some day, rather than gasoline. The ability to just conveniently switch cars, which robocars can give, lets us use the right power train to match our desires for a given trip, not try to force one power train to do everything. The Harris Ranch Supercharger already has the congestion you describe; it was built as a single charging station as an early prototype, and it looks like they're a couple months off from finishing the 8 bay Supercharger station there. But this is a great failure mode to have compared to, say, Solyndra. Tesla is having minor growing pains, but there is nothing that is fundamentally hard to get right in the long run here. I do think it would be good for Tesla to work on serving more locations instead of having huge numbers of charging stations in a small number of locations, but perhaps that will get better as time goes on. My suspicion is that a restaurant operator being offered 8 Supercharger bays of customers for their food might find that hard to turn down, whereas 2 Supercharger bays may not have enough impact on the bottom line to be worth thinking about the contract involved. Maybe the cutoffs aren't exactly there, but we may not yet have enough Teslas on the road for the critical mass that the typical business will find persuasive. Are you saying you think it's unfortunate that Tesla elected to not permanently cut their Supercharger rate in half (which would have happened if they just adopted the Japanese CHAdeMO standard)? Your concerns about freedom may mean that you may not want a Tesla in the next 6 months, but I think within a year or two the vaguely high end hotels are all going to decide they need to support overnight Tesla charging, at least in parts of the world where Teslas are popular. It probably doesn't take that many nights per year of losing Tesla owners' business to competitors before the $2k-$3k that the installation to charge one car will probably cost starts to look like a bargin. And there are probably starting to be enough hotels in California with charging stations that the ones without charging stations will start losing a bit of business. If you want to drive a car to Burning Man, though, that may get more challenging. One other thing to put in perspective with the Supercharges is that I've seen a rumor that you can get four Supercharger locations for a million dollars. If that's true, building 500 Supercharger stations ought to cost about half what Massachusetts is going to spend to rehabilitate the Longfellow Bridge which carries the MBTA Red Line, pedestrian, bicycle, and automobile traffic across the Charles River between Boston and Cambridge. 500 Supercharger stations works out to just over 1 per hundred miles of Interstate highway over that whole system, which provides a minimal level of coverage, even if it's not quite the density you want. And Tesla might be able to eventually spend more than half the cost of a single bridge rehabilitation project on Superchargers, too. If the typical gas station can cope with three or four grades of gas and sometimes also diesel, why do people assume electric vehicle charging can't have as many standards as fossil fuels? Those Telsa superchargers are 90kw, so a bank of 10 is almost a megawatt -- hard to get in many places, and hard to provide reliably with solar. If there were thousands of electrics on I-5 it would be an immense project to supercharge them all in the middle of the central valley. Yes, I understand how the giant battery of the Tesla wanted 90kw rather than 45kw (or in theory 60kw) from CHAdeMO, I just wish that work had started earlier to design a standard that could be shared. There is a version of 1772 that is supposed to come out doing 90kw, and presumably Tesla will have an adapter, but a single standard would help the network effect here. I think the better design for an electric car is a small, light car, capable of doing less than 100 wh/mile. (The model S is around 300 wh/mile.) Put a 20kwh battery in that and you have 200 miles of range, so no anxiety in driving around a large city, but still not for road trips. When the batteries get to $300/kwh in a few years, that's a reasonably affordable $6K battery, and if you do want to take it on road trips, the 60kw fast charger could get you an extra 100 miles in 10 minutes, not too much longer than a refuel and pee break. But I still think the better answer is to just switch to a liquid fuel car for the raod trips. Use biofuel if you want to be lower emissions -- in fact some biofuels would be lower emissions than the electricity. North America has not had very much of a CHAdeMO network anyway; I won't be surprised if by the end of 2013, North America has more Supercharger locations than CHAdeMO locations. And Superchargers target larger batteries so they don't need to be spaced as closely together; if you want to minimally cover 1000 miles of highway, you may need twice as many CHAdeMO locations as Supercharger locations. The 90 kw SAE combo plug standard seems to be enthusiastically supported by companies who seem like they may prefer that electric cars never take off. It's not clear to me who's ever going to spend money building out that network. If we could get batteries down to $75/kwh, would you still be opposed to using an electric car for road trips? I'm wondering how the Smart Electric car compares to your 100 wh/mile, but given that it's not that much over 100 MPGe and thus not much better than a LEAF, I bet it doesn't come anywhere near that. Is Burning Man going to abandon the fossil fuel generators and switch to solar / batteries / wind one of these years? Burning man is not one thing, it is whatever generators people bring for their camps. Cheaper batteries are great, though they also should get lighter if they can. One question I am curious about is just what effect supercharging has on battery life. In fact, I am keen to see more real study of battery life, and how it is affected not just by chemistry but by the various duty cycles of usage and recharge. How much life are you eating up by charging to 100%? How much by draining to zero? How much by jackrabbiting? Not that there can't be good answers to these questions, but they don't even exist for the liquid fuel cars. There is a big slope with electric cars if you can make them lightweight. Heavy electric cars require heavy battery. Some of the battery capacity is going to just moving the battery, so returns diminish. Likewise, a light car with a light battery is hugely more efficient. Perhaps the road trips I have taken are atypical, but I just don't see how many of them could have been done by an electric, without a massive, massive increase in charging infrastructure in some very remote and rural places. I've had road trips where I was concerned if I would easily find gasoline. But as I have said, the whole point is you don't have to do that or want to do that. Those road trips are just a fraction of my car use. There is no great need to do them in my city car. The Tesla charger is better than the Chademo or others, but I also think that the amount of charging infrastructure is small and gasoline's 100 year head start very challenging to overcome. It would be nice if all could work together, even if it means everybody switches to Telsa's standard or a 90kw version of Chademo or combo plug or something. Right now, nobody writes a story about an electric road trip that isn't a story about how much they worried and wondered about recharging. I want to see a story of an electric road trip that was about the scenery. But again, we're a long way from getting rid of gasoline, and it's a mistake to go nuts on trying to make the long tail of trips electric. Far better to put our energy (the metaphorical kind) into improving electric use and effectiveness where electric is most practical, and accepting that gasoline will still dominate the long road trips for many years. I don't understand the need to spend a lot of effort into making worrisome electric roadtrips when there is so much to be done in the city to get adoption. If enough people start bringing batteries and solar panels to Burning Man, will there eventually be pressure to ban the relatively few remaining diesel generators? The key point that keeps being repeated on the Tesla forums, though perhaps with less supporting evidence that one might like, is that Supercharging does not seem to put any more wear and tear on the batteries than 240V charging at 30A-70A for the same number of charge / discharge cycles. The thing that does have a large impact on battery life is apparently how often the batteries are charged at the range setting of 100% full, instead of the standard charge setting at something like 85% full. I think the road trips you've taken may be different than the road trips I've taken over the years, but that doesn't answer the question of which pattern is more typical. I'm sure I've been in an automobile more than 100 miles from the nearest Interstate Highway on the Big Island of Hawaii, and possibly on a few other Hawaiian islands, but I'm not sure if I've ever been in an automobile more than 100 miles from the nearest Interstate Highway anywhere outside Hawaii. Are your rural road trips in places where people don't even have outlets for electric clothes dryers, or is the issue just that you don't want to wait the amount of time that would be required to charge with such an outlet? A Supercharger station consisting of a small solar array and a fixed 85 kwh battery ought to cost less than $100k, maybe even less than $50k even at today's prices, if you're looking for rural coverage in places where you know the station will be used less than once an day and if a 120 kw grid connection is prohibitively expensive. I think installing an underground gas tank costs more like $250,000, and refilling that gas tank is also more labor intensive once the initial installation is done. I think somewhere around 10-15 years ago, the safety standards for underground tanks in the US became more rigorous, and I doubt there are many gas stations in the US with tanks much more than about 20 years old at this point, so I think in some ways your 100 years may be misleading. Battery energy density per unit of mass certainly would need to improve to make battery powered air travel practical, and I think that will encourage that research, but I also think the current energy density is already adequate for automobile use, though better energy density would lead to a small energy efficiency improvement for automobiles. Off-grid solar is not green generally, so it's not a good answer at Burning Man -- or for a Tesla charging station. Off-grid solar ends up discarding most of the power generated by the panels. Yes, gasoline is expensive too. If we didn't already have a giant gasoline system, this would be a different question. But we do. If Burning Man were to make sure that the nameplate capacity of the solar panels was less than what was actually going to be consumed, I don't see how that power would be wasted, although then you might need diesel generators to fill in the gaps if people aren't willing to adjust the loads to match the power produced. And if you had enough batteries to store power to cover nighttime usage and solar panels to provide power for charging that much, again, I don't see where the waste is. There might be some concerns about cloudy vs sunny days, but I also think I've heard Elon Musk claiming that that's not really a big deal (without really providing substantiating evidence that I've seen). But then, is getting to Burning Man instead of staying home a green activity? I wasn't necessarily thinking that a minimal, low usage Supercharger station would have to be completely off grid; if you assume that a grid connection is available, but it may be a lot less than 120 kw, then a relatively small solar array can feed power to the grid when the fixed battery is full, and the battery can exist as a way to feed power into the car at a rate that exceeds what the grid can support. You might even consider recharging the fixed battery from the grid to supplement the solar. Do the scenic roads that you take tend to count as US highways or state highways? I'm wondering if we can get any estimate of how many Superchargers would be needed to cover the routes you like to take. Off-grid solar normally stores to batteries. When the batteries are not in significant discharge and there is light load, the power of the panels is thrown away. That's fairly often, because people building off-grid solar want to make sure they have enough battery to deal with a stream of cloudy days, they want the batteries topped up at the end of a sunny day to last the night and the possible coming cloudy days. When batteries are not just full, but anywhere near full, they can't take the output of the panels, it must be discarded if there is no load to use it on. You are correct, if somebody makes a mini-grid, with generator power and solar, then they can make sure they use all the solar energy. Sadly, most people who want to put up off-grid solar have philosophical objections to the generator. Because of that, they do irrational things, like overprovision the solar or other green gear, wasting money (and embodied non-green energy) which could be used to make the world much greener in other places. In extreme cases, if you factor in the embodied energy and the total life-cycle considerations on the battery bank, it's not out of the question that some installations could be more negative than the generator. One example of that is what is sometimes done for camping solar power. While such installations are usually small, so not too bad, I have seen people who purchase solar panels for use only on camping trips and only at Burning Man. These panels go up for a few weeks a year and sit in a garage or on top of a bus or RV the rest of the year. Panels tend to have one year's output of embodied grid energy in them, up to 4 years for the older polycrystaline panels. Using them just for camping is the opposite of green. A camping solar panel needs to be one that is part of a grid-tied installation, normally mounted in a sunny place, tilted to the latitude and facing south. It must then be taken down for the camping trip for a short time, then installed at the campsite, and then quickly put back in place in the grid-tie system when done. This is not the common situation though. Going to Burning Man is in no way a green activity, especially for those who live outside of the Reno area. 99% of Burning Man's emissions are the travel to get there. The generators there and the fires are a minor part. Yes, a grid-tied charging station with storage to speed up the supercharge is a workable plan. Though the solar panel is orthogonal, it does not need to be at the station, it can be anywhere on the planet. (Ideally in fact it's in a place like New Mexico or a sunny part of China.) Well, almost. You might declare that supercharging is faster on a sunny day and slower at night, and thus have less battery if the panel is local and you are willing to tolerate the variability. Of course, such a station also has the issue that once somebody has used it, it can't be re-used for some significant amount of time. Perhaps OK for rare stations in a world of few electric cars. Where is the $1M/mile number for rail-rebuild? Road lane-mile costs can be quite low for chipsealed rural roads. It varies a lot based on the state, the terrain and urban/rural, but a median cost of $1.5M/lane-mile is commonly cited for highway level roads, with occasional interchanges etc. If you had lots and lots of electric cars on rural roads, you need a lot of supercharging stations. Every 50 miles would probably suit the lone Tesla driver pretty well, but what would it cost to put in the gigawatts needed if 1/3 the cars passing Harris Ranch on I-5 were electric needing a supercharge? If 1/3 of the cars passing Harris Ranch need Supercharging, you ought to be thinking about that in terms of cost per car and not cost per mile of road. Tesla seems to think that a $2k/car charge for the 60 kwh version for Supercharging will cover the cost of building out the Supercharger network. I'm not sure that long term, putting solar panels in less sunny places is such a bad thing. Obviously if there is a finite number of solar panels the world is going to produce each year, and global carbon emissions are the only thing we want to optimize for, putting solar panels only in sunny places seems like the right answer. However, people's willingness to overpay for a kilowatt hour of solar relative to natural gas has the potential to drive up solar panel production volumes, and the thing that maximizes solar panel production over the long run may be what best reduces global carbon emissions. Are you arguing that Germany's massive investment in solar has been an environmental disaster since they get less sun than pretty much all of the 48 states? If you wanted Germany to import hydofracked natural gas from the US and offset that by having German subsidize solar panels in the US, you'll probably end up burning more dirty fossil fuel shipping the natural gas across the Atlantic. Also, Germany is getting some long term economic stability out of owning the solar panels, and I'm not sure there's an alternative way for Germany to get that if they put the solar panels in the US and import the natural gas. To point out that people are not following the best course to their goal is not to say that the lesser courses are disasters -- unless they are really bad. I do believe that human energy and money should be mostly applied to the most effective methods though. The issue with supercharging for electric cars is not the cost of the stations, it's the peak-load power distribution. The cost of our entire electrical grid -- and thus our electricity -- is, to a large factor, based on the peak capacity of the grid which can be even more than the fuel cost of the fuel-based generators. A highway supercharging station will be mostly about mid-day charging. Most electric cars will wake up full, charged off of cheap baseload in the middle of the night. And that's great, as they drive around town all day on electricity. Nobody will need a charge, even a supercharge, until mid-day, and few will need a supercharge after dark because traffic is light. So the supercharging will largely come at the worst possible time for the grid, and the most expensive time if on ToD metering. Putting 100 megawatts of peak capacity, allowing about perhaps 1,600 cars/hour, is a pretty grand effort. On the plus side the supercharge time is the peak sun time, so solar has some merit, but you can't be down just because it's cloudy or 5pm in the winter. So you probably need to put in a decent sized gas-fired plant at the supercharging center. Not impossible, but expensive combined with the panels. Grid-tie is the only way to have green solar. If you want backup power during a power outage, buying batteries just for insurance seems a poor choice, but I would have to work out the math. Vertical probably does decently in Mass, about 85% of the proper tilt. A steep tilt would do about 90% and still keep the snow off. I've often wondered if solar arrays might benefit by having a hand-crank for their tilt that you can adjust every couple of weeks to get that 2nd axis. Of course don't forget that Arizona is 50-60% better than Massachusetts and that's no minor difference. You might want to do the math on getting the generator and putting up panels there. It does seem that Tesla plans to grid tie the Superchargers and use the grid as a battery unless getting enough grid capacity to a reasonable location is exceptionally difficult. If there ends up being a big solar array next to a big Supercharger installation, chances are that on the cloudy days, the restaurant next to the Supercharger station will not be running the air conditioning nearly as hard as on bright sunny days. Tesla claims the goal is that over a year the solar will put more power into the grid than the Superchargers pull out, which implies that on cloudless days, the solar should on average exceed the Supercharger power use and help to cover some air conditioning load that might now be covered by a fossil fuel plant; this suggests that the Superchargers should reduce the peak strain on the grid if the solar ends up near the Superchargers (or in other locations that turn out to be equally good for the grid). Elon has talked about a GE combined cycle natural gas plant being 60% efficient, vs 20% efficiency burning natural gas in an internal combustion engine (presumably in a truck or automobile or bus), so natural gas electric turbine next to Supercharger station may still be better than the non-EV alternatives. Even so, the Honda GX CNG model for many years routinely won the top ranking as greenest vehicle in the USA for emissions, though recently it was surprassed by the lightweight Mitsubishi Miev -- but not by the other electrics. However, those comparisons are done on the power of the existing grid, which is fairly dirty on average. A dedicated new NG power plant at the charging station should give those electrics a better emissions score. But I still maintain that while it's possible to get the supercharging working, it seems like the wrong thing to spend all the effort on. Just make it easy to switch to a fast-refuel or long range vehicle (or use the trailer approach here) for the long trips, and use the electric vehicle where it shines in the city. At least until we get the new generations of batteries that fix these problems, by being smaller, lighter, cheaper and/or faster charging. I'm confused. First you say that Supercharging is faster than it needs to be, and then you say we need faster charging? Is there some nuance to what you're saying that you could make clearer? Tesla found that only 4% of their buyers wanted the 40kwh version, and announced this week that they won't be taking 40kwh orders in the future, and that they've decided that the most cost effective thing to do with the existing 40kwh orders is ship 60kwh cars software limited to 40kwh (unless buyers pay to have the software limit removed). How are the Tesla Model S battery packs not already small enough, light enough, and able to be charged quickly enough? I agree the price needs to come down, but part of that is that Tesla so far only knows how to make something like 400/week or 500/week of something where there's a lot more demand than that, and they're trying to hold the price something like 25% above the production cost this year, presumably in part to save up money to build a bigger factory and in part to sell what they are able to make only to the people willing to pay the most. So there are lots of way that pack is not already small enough and light enough. There is a bit of a cliff here. Get your vehicle lighter (the model S is not light, even without that battery) and it needs less battery, returns get better the lighter you can make things. I'm not saying Teslas are not great fun to drive and people don't want them. They are just not economical at this time. That will change in a few years. The big debate people have is "does the early non-economical demand drive the development until it gets economical?" Possibly; Tesla is demonstrating things that some people did not believe. On the other hand, I think if you had a car that drives like the model S in 5 years for 1/3 the price, it would sell almost as well without the history, and there are investors who would be ready to take that bet. Since "supercharging" has a completely different meaning in an automotive context, perhaps this is not the best term. Perhaps a lesson from laptop batteries? The main thing that struck me with regard to the trailer idea, speaking as someone who grew up on a farm driving a tractor and various farm implements, is that trailers are way more trouble to drive than many people may realize. Parallel parking is right out for most, and backing up and even making turns properly will be tough. But I agree about the desire to reduce the weight, and I wonder if a lesson could be taken from the laptops of yesteryear, some of which had slots for extra batteries for long trips. Imagine that instead of the spare tire under a luggage area in the rear of the car, there are carefully designed slots that would accept individual batteries. (wave hands at good industrial design) In a pure EV, they'd be installed only when you anticipated a longer drive, and in a plug-in hybrid, you'd take them out on longer trips where the weight would be problematic. Well, I have two thoughts about the stability of trailers. They are not hard to drive ordinary roads, but yes, untrained people would have big problems backing up and parking in certain spots. The simplest solution might be a very short trailer which attaches to special receivers left and right, so it does not sway left or right. (It could sway up and down.) So more like an extra axle. Perhaps just 2 feet long, this would then fit in parking spaces as well. The other solution was to have a steering motor on the trailer wheels -- possibly two independent motors -- so that with computerized signals from the car and its steering wheel, you can back it up without thinking much about it. However, this has to be a longer trailer. Finally, another option is to have a 3rd wheel that can come down from the trailer tongue and some low power electric motors, and make it very easy to connect and disconnect (already good for pick up and drop off.) That makes it a bit of a pain to deal with reversing and parking problems by disconnect, but not a killer, and it could follow you around even. Full blown robotic connect/disconnect is not out of the question here, though that adds to cost and adds risk of failure. I have a 2011 Prius- not the most fun car to drive but I like the savings on regular gasoline-it's a good car too, being reliable, good design, practical, etc. Plus I only paid $21,000, bought it as a left over and got 60 months 0% financing. The Tesla is a beautiful car but out of my financial range, like the majority of people-I saw a bare chassis at the King of Prussia mall near where I live and was amazed at the simplicity- I also like the Chevrolet Volt and plug-in concept, although they're a bit high price for me as well. From reading this article and many more on the internet, it seems having the the all electric capability and the gas engine for long distance is the best combination right now. In the future, a better battery, capable of holding a charge longer, additional capacitors supplementing the battery, more charging stations, future battery swapping stations equivalent to a gas fill up, would reduce the range anxiety. The positives outweigh all the negatives of this technology, the cleaner energy, the reduction of oil dependency from foreign shores and all of the political implications they imply, the reduction in pollution, improvement of air quality, global warming concerns. This technology already has had a positive impact on car manufacturing with lighter, new materials, replacement of previous hydraulic components with electric ones, regenerative braking, etc. and in my opinion will continue forever, especially as new technologies are discovered! One item I forgot to mention was solar-not sure why this technology hasn't been incorporated more on the tops of cars to aid some aspect of the cars functioning that would otherwise be a drain on the electric battery or a supplement. The Prius had or has some option but it doesn't seem to be too popular.